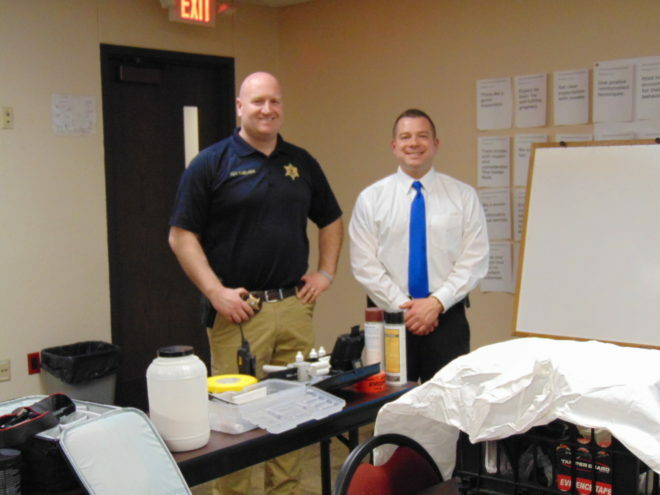 Detectives Delavan and Bird conducted a presentation on crime scene response with a number of forensic tools for the class to view. Anyone watch CSI in any of its forms? “They’re so unrealistic,” said Detective David Bird as he began a presentation on crime scene response. “I can’t watch them.” (GASP!) An entertainment, action, forensic, cop show that solves every case inside the course of an hour is ‘unrealistic’? I guess that’s why doctors don’t watch sitcoms and dramas based in hospitals, cops don’t watch cop shows, and superheroes don’t watch superhero shows. The programs skip over the ‘boring’ details that, in reality, can make or break a case. They ignore the fact that luminal can actually destroy evidence. They never show all the hours of exacting attention to detail it can take to process a crime scene correctly. The programs only show the evidence actually being found and race to the exciting parts that keep viewers coming back for more. “We might have a major crime with minimum evidence,” Det. Bird said. “Or we might have a minor crime with tons of evidence. The ‘CSI effect’ is the unrealistic expectations of the jurors from watching the TV shows. They think irrefutable evidence will be available in every case. They don’t realize that in real life it can take up to nine months to get fingerprint results from AFIS. “You can’t even test to become a detective until you have been on patrol for three years. When you do become a detective, you go through a lot of training. You can take courses that interest you. 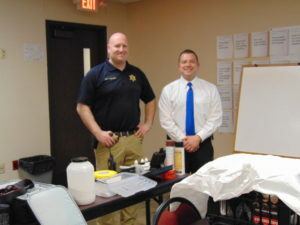 There are classes on interview techniques, computer crimes forensics, forensic pathology, and so much more. In some classes, the actual detectives or prosecutors who presented a case will come in and show/tell us how they figured out a crime. You then take your hours of training and put it into practice. “The first thing we do is take photos,” said Det. Bird. “We place a marker everywhere we will be searching – each room, each closet,” said Det. Delavan. “We take pictures going in. We take exit pictures going out. We take pictures as we find stuff. “Track drug sales through Messenger,” Det. Bird said. “See your photos and videos, even check your bank account information,” said Det. Delavan. 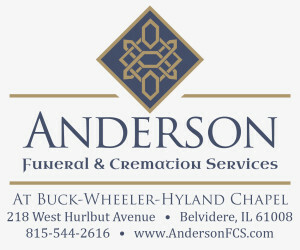 For complete article, pick up the April 4 Belvidere Daily Republican.